Who are you calling pea brain? One reference to trout I often see/hear is “they are stupid, their brain is only the size of a pea”. While the actual brain size reference maybe correct, the stupid part is misplaced. After all, trout have been on the planet 2.5 times longer than humans, that’s a lot of evolution backing up that brain! These fish learn quickly too when given the chance, let me explain. 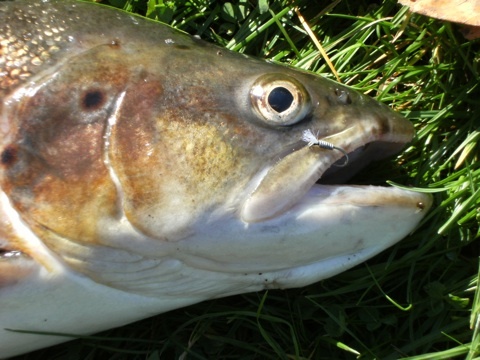 Until recent times the vast majority of trout once caught were dispatched and eaten. So when a fish made a mistake (i.e. took an anglers fly) that was game over for the trout unless it got away. Not much opportunity to learn in that situation and so they became perceived as dumb over time. Now with vastly increased catch and release on many waters and high angling pressure on some, including put and take fisheries, trout get vastly greater opportunities to learn about anglers and their flies. It matters not whether a fish is completely wild or stocked after spending some part of its life in a hatchery. With experience of anglers the fish will learn and failure on our part to adapt means catching little or nothing. This change can be as simple as changing fly colour, profile, retrieve style, etc. The most startling example of the need to change occurred to me under very artificial circumstances several years ago. I had been booked to host a corporate group of novice fly fishers at a stocked stillwater venue. The day was incredibly hot in the height of summer and trout were not in a feeding mood (see O2). To ensure everyone went home happy with a fish, they were allowed to catch one fish each from a stock pond. These fish had never seen an anglers fly before, so when the first cast hit the water, the fly was taken within seconds and the fish duly landed. The next angler made a cast to catch their fish and the fly sank longer, still nothing took. The situation was remedied by starting a retrieve, the hit came instantly and the fish was landed. The next angler stepped forward, the cast and retrieve failed to induce a take, changing the retrieve on the following cast worked though. After that nothing. I then changed the fly and the whole sequence repeated, first cast was hit immediately, etc. This went on until everyone caught a fish, then we left them alone. I’m not going to delve into the mechanisms by which the trout learned and communicated danger to others in that pond so fast in this post, however that is clearly what happened. It was an amazing learning experience for me, the water was clear and I could see everything, takes, refusals, fish pushing others off the fly before they took it. All this from what many people would dismiss as stupid hatchery fish, that had never before seen a fly. Now apply this to fish that see regular angling pressure for months/years on any waterway wild or stocked. See the need to constantly change, adapt, evolve what you are doing? Next Next post: O2 – Just can’t live without it!